Though it would have been the cheapest alternative, Seattle City Light has dropped an unpopular alternative route that would have required 100-foot towers across Capitol Hill and the Central District for its planned 115-kilovolt transmission line connecting the coming Denny Substation with the city’s grid. CHS first reported on the issue in October as City Light began the public process to scope the project. City Light planners said the route — up Denny to 14th Ave and then south through the CD to the Massachusetts substation — was an unlikely choice but included the route as one of three proposed options for the line. Neighbors in the area took to flyering existing utility poles and sharing information via email lists and, of course, by word of mouth. By January, the public feedback on the route was still coming in — and still decidedly against the proposed alternative. Thank you to CHS for publicizing this and to all of you who contacted SCL and asked for the 14th Avenue alternative to be eliminated from consideration. Great community action! You have to wonder if the boneheaded maroon who came up with this just did it for gits and shiggles? Why not just knock down some of our old character structures for the poles and put chain restaurants at the base? And eliminate some street parking while you’re at it? That’d complete the angst in the neighborhood. I’m betting they proposed it just so there wouldn’t be as much public outcry about how expensive the better solutions will be. Later, they can say “we had a cheaper alternative, but neighborhoods were all against it”. Exactly — if they don’t include the cheapest option, there will be somebody bitching about “wasting tax/ratepayer dollars” and “yet another gold-plated tunnel as the solution to a problem.” Now they can go ahead with the expense of an underground route — which was probably their own preference all along — with the political cover they need. Far from being a “maroon”* this was a savvy move by someone who is well-acquainted with the Seattle “process.” The easiest way to get the decision you want is to offer obviously-poisoned alternatives. * you realize that has racial overtones, right? I know Bugs Bunny trained us to say “moron” that way but I wince every time I see or hear it. Great news! Thanks for staying on top if it! 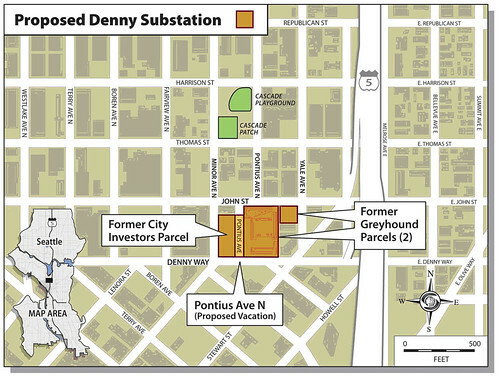 Still waiting for them to realize that a substation on Denny is a terrible idea. When are we going to stop treating Denny as the city’s trash heap and improve it into a pleasant street? A substation would be a great thing to put under the freeway or…on the bottom floor of an Amazon building. Sing hallelujah in February! I think public outcry for an untenable high voltage transmission line route was actually effective. Congrats to everyone who took the time and effort to speak out. Congrats to everyone else on Capitol Hill and the international District to have such concerned neighbors.